I married Jane in 1976 and have 2 brothers, 2 sons, and 2 grandsons. I grew up in Northeast Minneapolis, and have spent my married life in St. Paul. I design, develop, and support software for airlines and airports. As part of my job I do get to travel internationally, but unfortunately spend all my time in the airport. I collect 18th century English tokens. After we were married Jane taught me how to embroider and crochet. 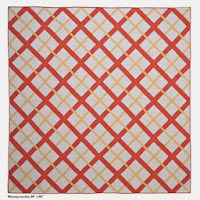 Jane made our first quilt in 1977 (machine pieced and machine quilted) and shortly after we started to make baby quilts for family. Jane would sketch a design which I would refine to make the math right, Jane would piece the top and I would embroider transfer images on the top. Jane would then do the quilting and finishing. 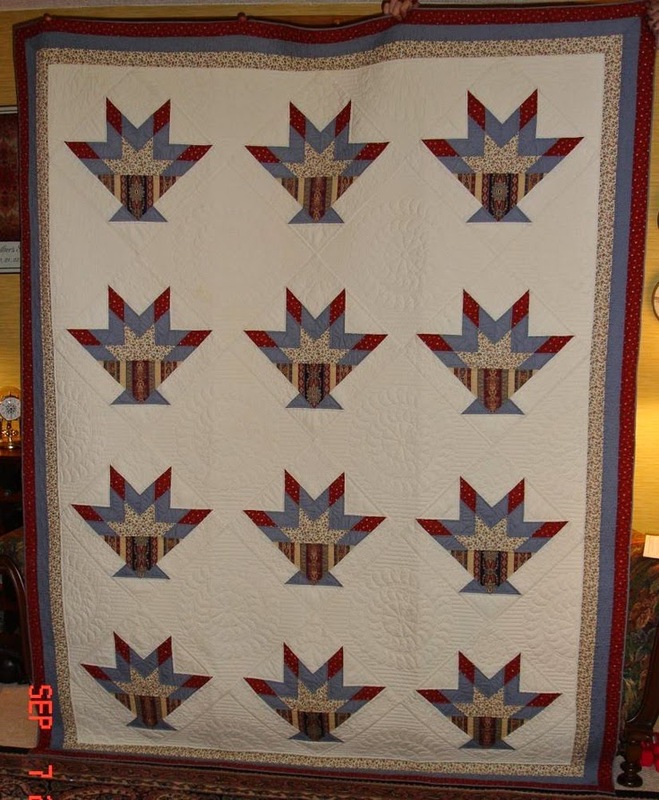 In 1983 I started my first quilt which won Sweepstakes award at the 1984 state fair. That quilt is now owned by the Minnesota State Historical Society. The quilt also won me a free membership with Minnesota Quilters. For many years I've also been the quilt judge at the state fair, the last few years I've alternated with another judge. I've made more than 100 quilts and wall hangings. For many years I was deeply involved in Minnesota Quilters, I served as President and was on the board for 13 years. I chaired 2 of their quilt shows and worked on 14 show committees. I also participated in most of the Quilt Discovery Days held around the state as part of the Minnesota Quilt History Project board of directors. During those years I did not get many quilts finished, but I've been quite productive since I retired from committee work. The last 2 years I've made a concerted effort to reduce my UFO count but there are still around 20 to finish + about 10 tops to quilt. My style is all over the map. I enjoy doing modern designs, traditional, "civil war", Amish" and just about everything else in between. Red ends up in most of my quilts. Now that the kids have left the nest and married and I am no longer deeply involved with Minnesota Quilters I try to quilt 15-20 hours per week. Jane and I also do several quilt retreats with a group of close friends. 12 pieced baskets set on point - red, white and blue. I used a Jinny Beyer border print for the baskets. Hand pieced and hand quilted as was expected back in 1984. It took a year to make, most of the time spent on the quilting. I've done so many it is impossible to choose, but my first quilt and the quilt I did for my oldest son (started in 1985, finished in 2013) would top the list. Jane and I both sew on older, metal body Berninas. I sew in one of the kids bedrooms, Jane sews in the other. However, most of the rooms in our house are at least partially used for quilting. I normally have some type of background noise going, either the tv or my iPod. Shop owners love seeing Jane and I enter their shop. Most of our stash is neatly folded and sorted by color/style in Jane's sewing room. The rest - not so much. I love piecing, don't really do applique. I even enjoy binding a quilt. Someday I will learn to do needle-turn applique. The close friends I've made over the years through quilting. Just do it. The joy in quilting is in the people you meet, the joy of the recipients of your quilts and the enjoyment in the process and finishing. Let me start by saying I'm not much of a quilt book buyer. 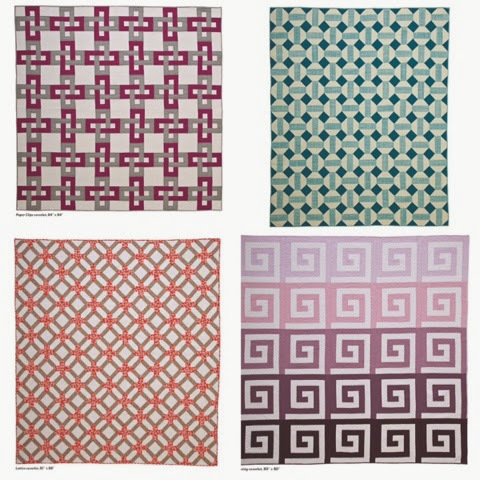 I find they have too much filler, for the most part (I know how to piece, make a sandwich, quilt and bind, thanks; I don't need you to tell me again...), and often don't have more than one pattern I would even have a slight interest in making. For that reason, I tend to borrow books I think have promise from the library, either hard copy or electronic. 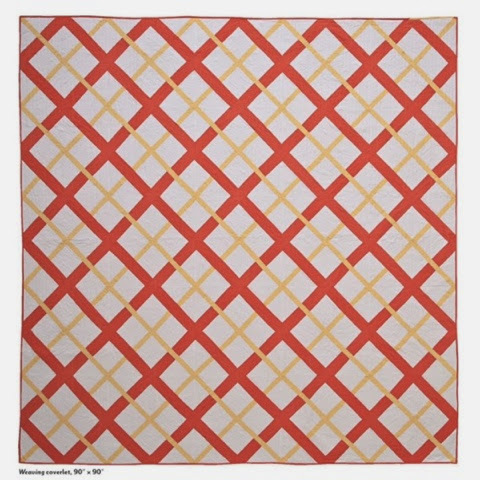 If I like it and find there are several quilts that interest me, I'll then purchase the book. 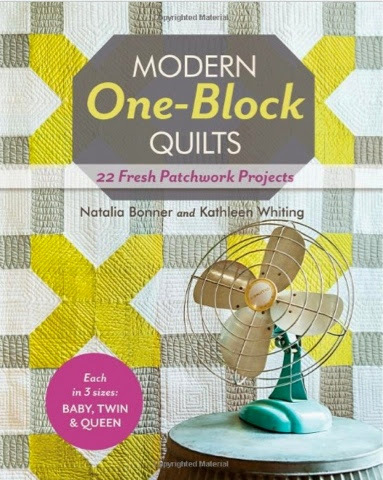 Modern One-Block Quilts by Natalia Bonner and Kathleen Whiting is one such book. It's full of the kind of projects I love: limited color palettes, mostly solids, and several pretty blocks that create a secondary pattern when joined together. It thrills me to no end! Bonner and Whiting break things down into strip-piecing methods and help you create blocks that look complicated simply. At $9.99 (Kindle edition), this book is a steal! Back in October, we were lucky enough to get our hands on some advance yardage of Monaluna's latest organic fabric collection Meadow for our Challenge Yourself guild challenge. Jennifer (AKA Monaluna) was kind enough to donate enough fabric for each of our members to get a lovely bundle of her fabrics. The challenge was to Challenge Yourself and choose something that you have always wanted to do by picking a project outside your comfort zone or on your bucket list. It was so fun to see what everyone came up with and even more fun to hear about their personal challenge. Carrie challenged herself to try reverse appliqué and to finish on time! …with a solid back to show off the quilting. Debra experimented with appliqué on some pillows. Elise did a scrappy quilt top and used green! Erin challenged herself to try a maple leaf pattern. 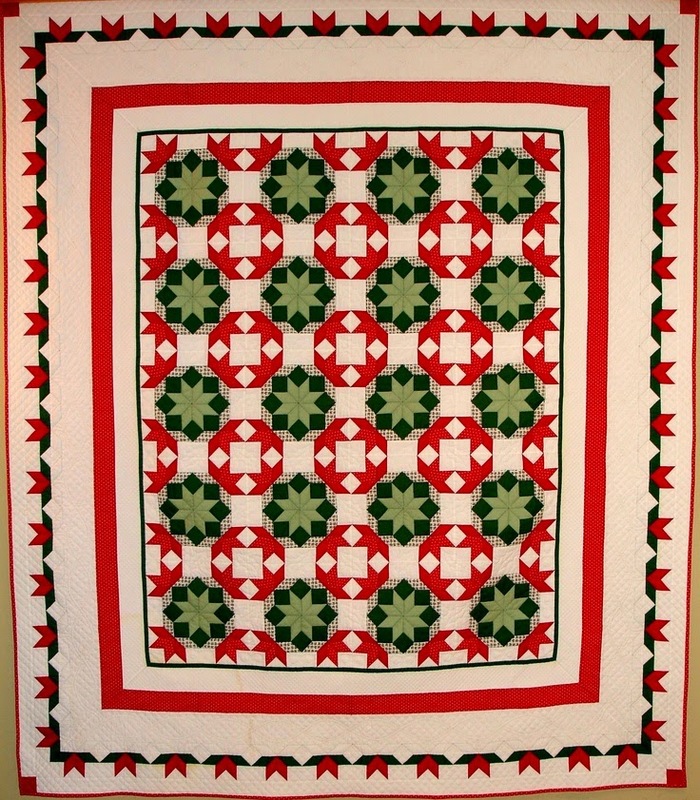 Jan's challenge was to use white to make a whirley gig quilt. Karen C. challenged herself to "put a bird on it". …and used up the scraps and some stash on the other side. Kristin S. gave herself a Hudson Bay Blanket challenge. 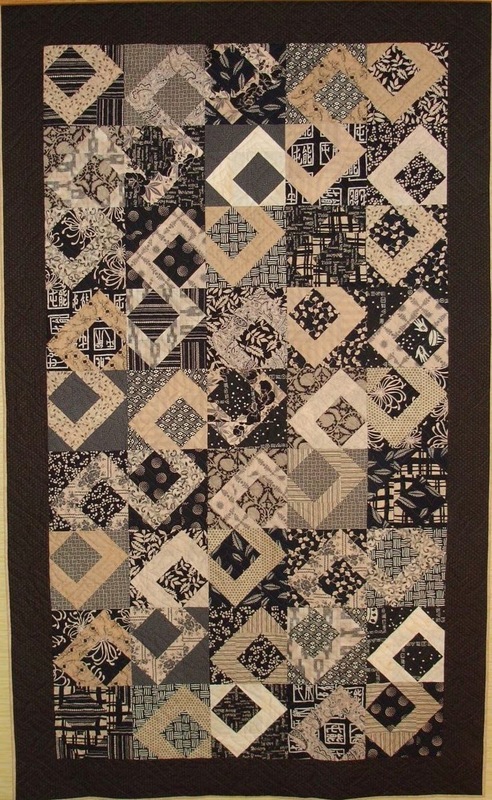 …and ended up with an all Monaluna quilt, using at least one print from each of her collections. Maria's challenge was to try machine appliqué. Mary took a Clam Shell challenge. Nikol using a wedge ruler that she purchased long ago and hadn't used yet. Rozina's challenge was using solids and trying needle turned appliqué. Sharon challenged herself to do some appliqué with a drunkard's path. Tracy tried getting away from her usual dark pallet and used white. I hear that there are still some quilts out there in process and am looking forward to what else our members come up with. You can see them if you stop in for one of our meetings and/or check our flickr page . You can also check out the hashtag #monalunameadow on Instagram. The meeting was held on March 13, 2014 at the Textile Center at 7 PM. Below is a summary of the meeting. March is the annual membership renewal meeting. New and renewing members who signed up at the meeting received a welcome package with information about the MMQG as well as fun surprises including a batting sampler, pin sampler, mini charm pack, glue bottle (based on Mary’s 10 minute tip from last year), and fat quarters donated by Lisa of Fresh Stash, and Faye of Twin Cities Quilting. Welcome packages are only available to those who join while supplies last. 27 members joined or renewed at the meeting! Welcome new and returning members! Thanks to Flaun and Lisa T. for their past service on the MMQG Board! New members are encouraged to complete a Member Spotlight for the blog. There is a standard questionnaire and it doesn’t take long to complete. It’s a great way for members to learn a bit about each other. Those who are interested should contact Chris or send an email to the general MMQG email (minneapolismqg [at] gmail [dot] com.). No blogging experience or technical skills necessary-- Chris and Carrie are very helpful and make it extremely easy. The results of the member survey were briefly discussed. Feedback was generally positive and will be used by the Board to plan future meetings, activities, and swaps. Members are encouraged to email the guild or contact individual board members with additional suggestions/ideas. Committees are needed to help the guild achieve many of the suggestions identified in the survey. If you would like to volunteer for a committee, please contact the Board and/or note your committee choice on your membership form. We have a new business member, the Madeline Island School of the Arts. You’ll notice their logo is now on the MMQG blog and there may be blog posts in the future. They offer multi-day quilt workshops in the beautiful setting of Madeline Island. If members are interested in holding another garage sale, we are looking for volunteers to plan and organize the event. Last year members brought items to a regular meeting and members “shopped” before the meeting and during the break. All proceeds went to the guild and leftover items were donated to charity. One suggested change is to allow members who sell items to keep a portion of the sale with a set percentage going back to the guild. 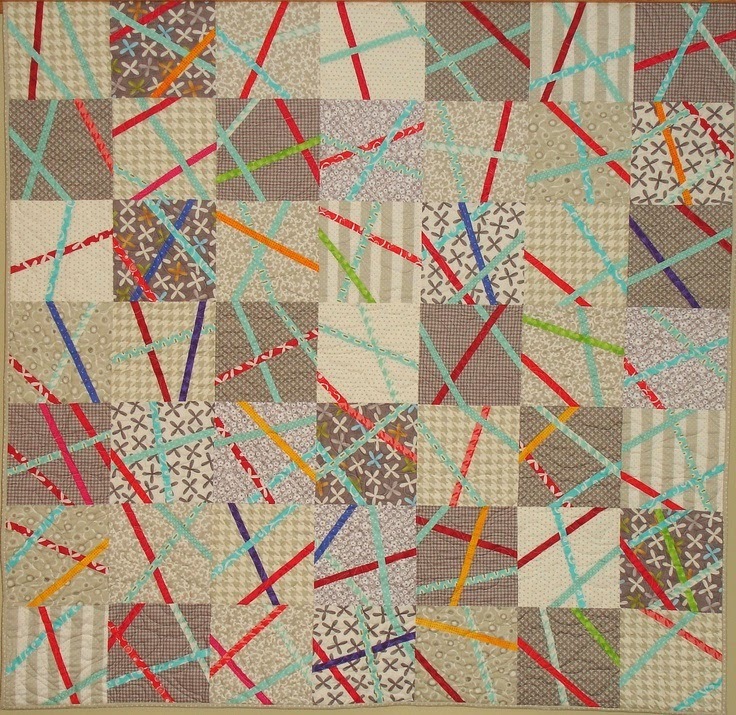 The MN Quilters are having their annual show June 12-14 in St. Cloud. Elizabeth Dackson who blogs at Don’t Call Me Betsy and wrote Becoming a Confident Quilter will be teaching 3 classes. She has agreed to host a trunk show for the MMQG on Saturday June 14. The guild will coordinate carpools that day for those that want to attend the quilt show and trunk show. Additional details to come. Alyssa Thomas of Penguin and Fish will be holding a trunk show and signing and doodling her new book, Sew and Stitch Embroidery. Books will be available for purchase, $24. Business member, Fresh Stash Fabric, will be vending at the meeting. Next Social—March 26th, 6:30 p.m. at Common Roots. 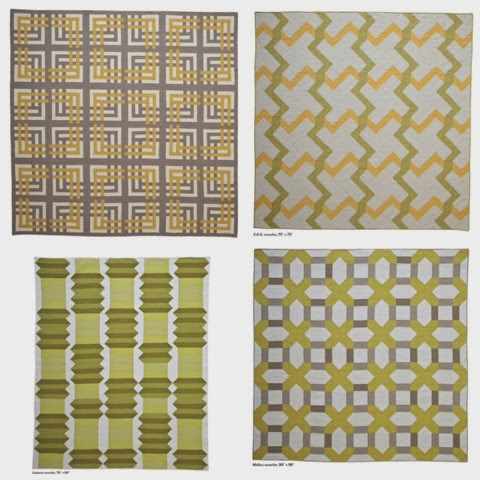 Many of us stay within the comfort zone of using coordinating fabrics from one fabric line. This challenge simply asks participants to make a project that mixes things up by using fabrics from more than one fabric line or designer. If that is not a challenge for you, feel free to self-interpret and bring a project that pushes your boundaries in some other way. 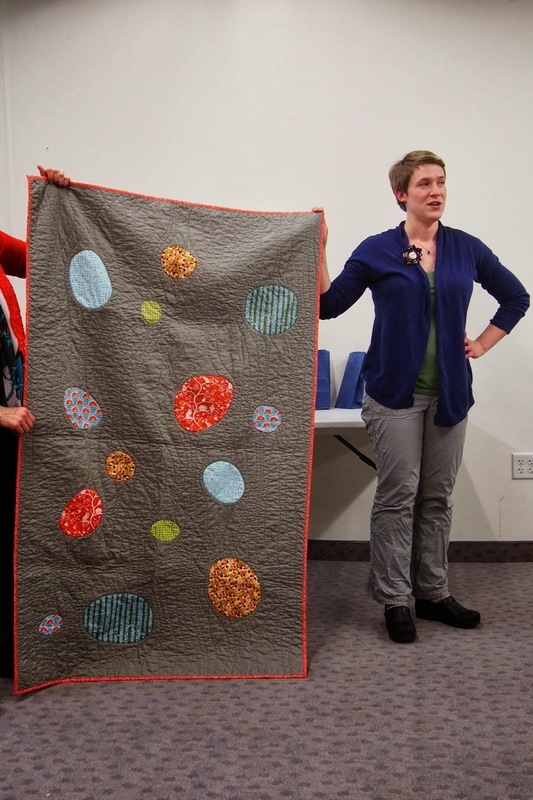 MMQG participated in a “Love” swap with the NYC Metro Mod Quilters in February. Our LOVEly quilts arrived from NY and were handed out by Flaun. Individual quilt photos are on the MMQG Flickr page. Members who participated in the Monaluna “challenge yourself challenge” revealed their projects and showcased some very impressive skills! Lisa will be doing a full recap of the challenge on an upcoming blog post, so stay tuned. Photos are up on the MMQG Flickr page. Members and guests had many inspiring finishes to show. Perhaps a sign of a very long winter?! Rozina volunteered to quilt up our "extra" blocks from last year's Madrona Road Challenge, Thanks Rozina for taking that on!